Transitions happen throughout our life! It’s important to plan for them whenever possible by anticipating changes and preparing. This week was a BIG transition for not only me, but for my entire family, including the dog! After running my International Coaching & Training company from my home-based office for nearly 15 years, I went back to work FULL-TIME in the corporate world. Although I will continue to serve my current clients I will selectively decide which future clients I will work with both as a speaker and a coach. Monday: ESTABLISHED NEW ROUTINE!! got up extra early, took dog for half the regular walk, fed him and ate my breakfast then finished kids’ lunches, got dressed while listening in to the news, applied makeup and fixed hair, got kids up, dropped off daughter at bus, trusted son would get to school on time (MISTAKE #1), went to work and met many new people and attended new hire orientation with about 8 others, panicked when I received a call from the school that my son was truant at 10:50, connected with husband and he handled it, ran to catch the 5:17 train home and battled with traffic from the train station to get home to a lovely dinner prepared by my husband, took dog for second half of walk, finished emails I didn’t finish on the train ride, showered, prepared sandwiches for next day, read through materials from work, was in bed by 9!! WEDNESDAY: same am routine and every seemed to work smoothly till I got to the train stop just a few minutes behind schedule. Did a load of wash before work! Brought my own lunch with me to save from having to go down to the cafeteria again. Through in a load of towels before walking the dog and put them in dryer when I returned. Nearly missed train as I folded bills to get them into the meter. (NOTE TO SELF: HAVE BILLS PRE-FOLDED AND READY TO GO!). Worked on learning new systems and getting acclimated at my new job. Hurried home to attend Grandma’s birthday celebration with the family. THURSDAY: had a little trouble waking up because I got to sleep a little later last night. Brought my lunch with me again. Ended up getting the next train (which wasn’t an express) and got to work just 20 minutes later. (NOTE TO SELF: DON’T PANIC, THERE’S ANOTHER TRAIN EVERY 15 MINUTES OR SO; LEAVING EXTRA TIME HAS BEEN A BENEFIT BECAUSE I AM STILL THERE BEFORE 8:30). Hubby had to work late and daughter arranged a ride home from cheer practice beings son was working. Held scheduled coaching sessions in the evening, then completed evening routine. FRIDAY: good morning, everything flowed smoothly! Got a lot of things accomplished at work and am running fairly smoothly. Enjoyed some lunch on the company and goodies left over from a training so I didn’t have to buy lunch. Took one train earlier and left a little more time to get down the elevator because I’ve been rushing to the train every day. Got home in time to meet husband and a friend to travel an hour to our daughter’s HS cheering at the FB game. Fortunately, lunch held me over and I wasn’t hungry for dinner. I’ve been stocking up on healthy snacks and water to keep in my office so I had plenty choices. Hit a deer on the way home from the game. Are you kidding….what a way to end my first week back on the corporate job! We’re ok but the car and the deer didn’t quite make it! So, I’m proud to say that I got through my week! Without my husband stepping up to prepare dinners and pick up what he saw I wasn’t able to get done, it would have been much more difficult. So, thank Goodness I have such a wonderful husband. I miss dinners with the family all together and miss communicating with each other more than anything. Preparing, planning, organizing, communicating and staying calm were the big winners this week!! 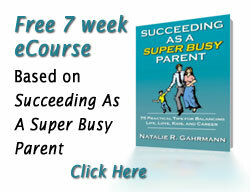 How much faster, busier, more hectic and demanding can our lives possibly get? These past two months have been especially challenging for me with numerous family issues and my own health concerns. Although I study life balance and help others through my teaching, speaking, writing and coaching I found myself bursting at the same seams I’ve helped others better handle. All of my techniques and strategies were in my tool box and once I took a deep breadth, re-focused, and took things more slowly I was able to manage day-to-day and see the rainbow at the end of all the rain that was pouring down in my life. Living a balanced life has become one of the biggest challenges in our society. However, as I’ve learned from my own experiences, until you get your thinking and actions aligned, you’ll naturally be out of balance. To be in balance, you need to align your life with your top priorities and live that way each and every day! Your priorities come from your core — your personal values. They define what is really most important to you. They help guide your decisions about where and how you will spend your time, money and energy. If you want to live a balanced life, begin by defining your core values and key priorities. Define what life balance means to you. A blanket answer will not resonate with every one of you. We will have different answers to what’s important to us and what life balance looks like for us. Life balance is a concept that has a different meaning for each of us. What’s a balanced lifestyle for one, might not be balanced for another. The key to getting the right balance, is making time for what’s important to you. Summer is coming!!! With summer comes longer days, more outdoor activities and more opportunities to do things together with your family. Now is the opportune time to put in a new habit of spending some quality time as a family after dinner to go for a walk, pedal through the neighborhood, do some extra reading, play ball, go out for ice cream, or whatever you and your family would enjoy doing together. It takes about 21 days to get a new habit in place. Once you’ve developed this time as a normal part of your daily routine, it will be easier to adapt your activities to other times of the year while still focusing on spending time together. You could also take this opportunity to create some activities just for you, for you and your spouse, or together with a friend or neighbor. Use this time consciously and create it to be what you want. It would be helpful to have a handful of activities you enjoy. Time is too easily frittered away when the effort is not taken to use it wisely. Select things that are fun and enjoyable that you’ll look forward to doing. Get in the rhythm of “being” the kind of person you want to be rather than being too SuperBusy to enjoy your life and loved ones! There is an art to taking vacation and getting the rest and rejuvenation you need. Here are some important tips posted in my blog at MyPath that will help you prevent work from spilling over into your personal time. 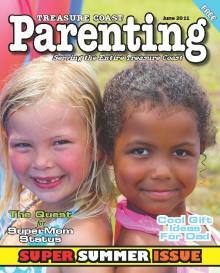 The current issue of Treasure Coast Parenting features an article I wrote about the “Top 10 Tips for Working from a Home-Based Office” . Read this article on page 36-37 of the magazine to learn how you can be productive and effective when working at home. These days I continually here about employees at every level of the organization who are overloaded with too much work. This chronic problem is mostly a result of numerous workforce reductions and vacation schedules. Many of us have experienced that dreadful sense of having far too much work to do and too little time to do it in. The option is to ignore it because you are “too busy” and to work unreasonably long hours just to stay on top of your workload. Unfortunately, the risk is that you may build up resentment, exhaustion and frustration that leads to poor quality work while you neglect other areas of your life and eventually experience intense levels of stress. Too many emails, text messages, etc. Employees complaining about work/life issues, limited career opportunities, or lack of skill development. If you colleagues are leaving in droves, find out why! Work more intelligently by focusing on the things that are important for job success and reduce the time you spend on lower priority tasks. I found a tool on line at the Mind Tools site, which can help you take the first step in looking at your work, Job Analysis. According to information on their site, job analysis is a key technique for managing job overload – an important source of stress. Proactively discuss with your boss the inefficiencies related to constant change and propose some realistic boundaries. Establish boundaries around when you can and cannot be interrupted by employees or colleagues. Turn on your phone only during designated hours or have your secretary impose a heavy filter on the incoming phone calls. If you are the secretary, keep conversations brief and get all necessary details during the first call. Prioritize your e-mail and correspondence. Don’t leave the email indicator on unless it’s absolutely critical for your job. Accept the possibility of a complete turn-about in your work as a result of uncertainties. Learn to reprioritize when change is necessary. Only permit emergency calls at work from family, friends, and neighbors. 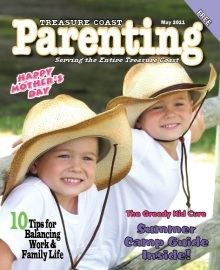 Read this article in the May issue of Treasure Coast Parenting to learn tips you can use in your own life to gain more balance. Imagine this…I was at the gym on the treadmill and opened one of my favorite magazines. 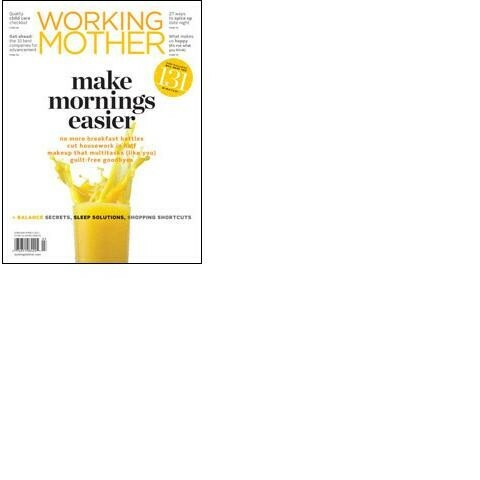 As I flipped through to choose a good article to read, I came across an article in Working Mother’s February/March edition that included tips when you have to work late. What strategies work for you when you have to work late?? When emergencies or catastophes strike, cars break down, accidents occur, or health issues arise, priorities often shift on a dime. It could take just seconds to temporarily or permanently change your entire life. As your time and attention changes to more pressing matters, what do you do with whatever is still left on your plate? How do you continue tending to the important when the urgent is so compelling? Reflecting on the recent tragedies in the world, including the earthquake and Tsunami in Japan, the major flooding, the bus accident on Route 95 in New York and other such events across the globe I wonder how people cope. Although I had no one personally from my family, friends or professional colleagues in the World Trade Center when the tragedy of 9-1-1 occured, we were fixated with the events. Those like me, in the peripheral, went on with our lives and work and continued to focus on other priorities. However, when it affects you personally, you may be immobilized and fixated on the necessary actions although other priorities continue to exist in your life. Balancing your other needs and those of your loved ones is likely a challenge. For those who have lived through a death of a loved one, accident, sudden emergency, natural disaster big or small….how did you cope? What are some suggestions you have for others who may now be going through similar experiences? Perfectionism is often mistakenly viewed as desirable or even necessary for success in our society. However, perfectionism is comprised of thoughts and behaviors focused on reaching unattainably high expectations. This drive actually interferes with success rather than contributing to it. So be careful if you’re on the cusp, and don’t confuse high-achievement with perfectionism!